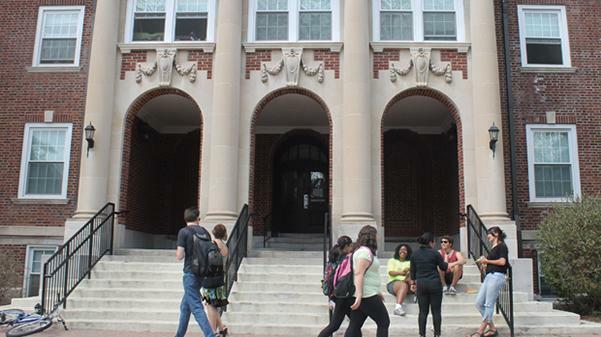 Students gather outside Niccolls Hall during a passing time between morning classes. Lindenwood’s graduate counseling degree program has not only placed eighth on a national list of 2017’s top 11 graduate counseling programs, but the department may soon be offering an early-start option for undergraduates. The program is still awaiting approval to offer up to nine credit hours to undergraduates so students can have better opportunities to become familiar with the program before formally entering it, said Michael Rankins, Lindenwood’s assistant dean of counseling. Rankins joined Lindenwood’s faculty in 2008. He said he heard that students were submitting reviews before the program was placed on the list. Out of the nine categories used to rank Lindenwood, the counseling program scored the highest in “Prepared for Career” with 4.7 out of 5 stars. The program also scored well in “Campus Safety” and “Student Diversity.” Lindenwood’s lowest score was in “Earning Potential” with 2 out of 5 stars. Graduate students submitted reviews to the Washington state-based organization SR Education Group, who then used the information to rank schools on its website, graduateprograms.com. Feedback from a minimum of 10 students is required for a university to be featured on the programs list, according to the website. Approximately 466 students at campuses across Missouri are actively enrolled in Lindenwood’s counseling program. Most of those are in the professional and school counseling schools, with the exception of some physiological examiner students. “We always try to remain mindful of what is a counselor education program really here to do?” he said. Lindenwood’s courses are parallels to state certification requirements. The school also utilizes about 50 adjunct staff across the state.